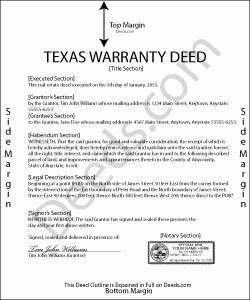 A general warranty deed in Texas contains both express and implied warranties. The Texas statutory form for a conveyance of real property, provided in Sec. 5.022 of the Texas Statutes, will convey a fee simple estate in real property with a covenant of general warranty. A covenant of general warranty binds the grantor to warrant and forever defend the property being conveyed to the grantee against every person lawfully claiming or to claim the same against the property, or any part thereof. The parties to a conveyance may insert any clause or use any form for a warranty deed not in contravention of law (Sec. 5.022). Unless a warranty deed provides otherwise, the use of the words "grant" or "convey" implies only that the grantor and the grantor's heirs covenant to the grantee and the grantee's heirs or assigns (1) That previous to the execution of the conveyance, the grantor has not conveyed the estate or any interest in the estate to any person other than the grantee and (2) that at the time of execution of the conveyance, the estate was free from encumbrances (Sec. 5.023). A general warranty deed is a commonly used real estate deed in Texas. To be effectively recorded by a county clerk in this state, a warranty deed must first be eligible for recording and then recorded in the county where the property is located. A warranty deed must contain the grantor's original signature. In order to be recorded, the instrument is required to have been acknowledged, sworn to with a jurat, or proved according to law (Sec. 12.001a). Any instrument conveying real property may not be recorded unless it is signed and acknowledged or sworn to by the grantor in the presence of two or more credible witnesses or acknowledged and sworn to before and certified by an officer authorized to take acknowledgments or oaths (Sec. 12.001b). If a warranty deed is acknowledged before a notary public in another state, it will be invalid if it does not have an official seal attached only if the jurisdiction in which the acknowledgment was taken requires the notary public to attach an official seal (Sec. 12.001d). A warranty deed in Texas is void as to a creditor or subsequent purchaser for valuable consideration without notice unless the deed has been acknowledged, sworn to, or proved and filed for record (Sec. 13.001). The unrecorded warranty deed will be binding on the parties to the instrument, on the party's heirs, and on a subsequent purchaser who does not pay a valuable consideration or who has notice of the instrument (Sec. 13.001c). When a warranty deed is properly recorded in the county where the property is located, it will be notice to all persons of the existence of the instrument and is subject to inspection by the public (Sec. 13.002). Rita M. said: I have not received the deed via email. That is what I was expecting. Let me know if I am incorrect in my thinking. Reply from Staff: Thanks for reaching out. While we do send some email notifications, we do not email documents. All orders are available via your account. You can log into your account from the menu button at the top left of most pages on the website. Connie E. said: Great service! Easy to download and view. Florida should have the Revocable Transfer on Death (TOD)deed, that many other States have. That's the one I really wanted. This one will do in the meantime. Robert h. said: excellent and simple to use. Great price for this. Reply from Staff: Thank you Robert! We really appreciate your feedback. Teresa H. said: I loved that there was a sample with the downloads. It made it much easier to fill out the document correctly. Reply from Staff: Thank you Teresa, have a great day!